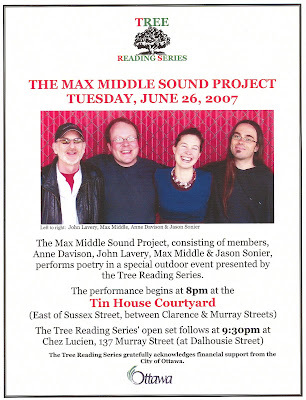 The Max Middle Sound Project consisting of members Anne Davison, John Lavery, Max Middle and Jason Sonier, executes multi-vocal performance poetry works in a one-time outdoor program presented by the Tree Reading Series. The ensemble enacts work from an artistically advanced and entertaining repertoire. The Tin House Courtyard is located between Clarence and Murray Streets, just east of Sussex Street. See map link below. NB In the event of rainfall, the Black Thorn Cafe, 15 Clarence Street, will provide space on their covered patio for the Max Middle Sound Project performance at 8pm. The feature performance in the Tin House Courtyard is followed by, a block east on Murray Street, at 9:30pm, the Tree Reading Series' open stage at Chez Lucien, 137 Murray Street at Dalhousie. The Max Middle Sound Project is an interdisciplinary collaboration committed to the integration of poetry, sound poetry and music incorporating elements of theatre and performance art as ancillary expression. The ensemble consists of four prominent Ottawa artists: Anne Davison, Max Middle, John Lavery and Jason Sonier. Davison is a concert cellist and music composer who performs in the realm of classical music and in dance projects. Lavery is an accomplished writer of fiction, a literary performer par excellence and a guitarist. 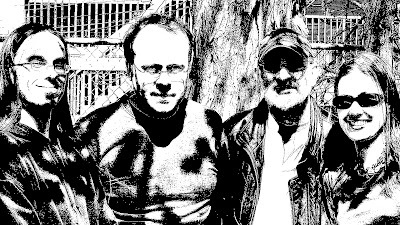 Middle is a poet working in verse, visual and sound poetry; he is also a micro-press publisher. Sonier is a highly versatile multi-instrumentalist musician and an established creative force within the ensemble. Each member is an accomplished and dynamic literary reader as well as a musician. The Max Middle Sound Project continues its performance practice with engagements across Ontario this summer and fall. A tour of the Toronto area and southern Ontario will take place in October centered on a performance in Toronto’s Test Reading Series, October 25th 2007. In September 2007, watch for the first readings in The A B Reading Series, a new literary reading series curated by Max Middle to be held in the Ottawa City Hall Art Gallery. See map with coordinates for the Tin House Courtyard and Chez Lucien here. Posted by Max Middle at 11:38 a.m.
Ottawa writer Mark Frutkin won the English-language Trillium Book Award today for his novel Fabrizio's Return. Toronto's Ken Babstock was named winner of the $10,000 Trillium Book Award for Poetry (English-language) for his collection Airstream Land Yacht. The corresponding French-language prize was a tie between Ottawa writer Daniel Castillo Durante for La passion des nomads and Toronto poet Paul Savoie for his poetry collection Crac. Posted by Max Middle at 9:05 p.m.
"this is an invitation to participate in a collaborative / constraint-based concrete poetry portfolio. Letraset was created as a business tool for the standardization of lettering in technical drawings and blueprints. Although it has fallen out of favour due to the proliferation of computers in technical drawing, letraset continues to be used in concrete poetry. By assigning the same material to a variety of international concrete poets and artists, this project examines how content and form interplay in concrete poetry, and will be an insight in to the malleability of language and materiality through different visual compositional structures and styles." Seventeen poets and artists agreed to participate. Each received a full sheet of Simplex letraset dry-transfer lettering (every participant received the same typeface, although the size of the face varied due to difficulties i had in finding enough sheets) and were restricted to using only the material supplied (i.e. : no additional materials), and responses had to fit on a single sheet of 8 ½" x 11" (or A4 if international) paper. Unfortunately, the portfolio is out of print. It was published in an edition of 60 copies, 20 of which were for sale. Posted by Max Middle at 11:29 a.m.